unforgettable illustrations and the power of laughter to teach proven principles that are guaranteed to strengthen any marriage.“I love to inspire people’s lives with truth and humor. 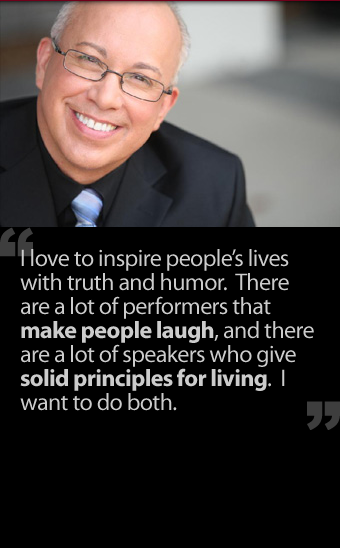 There are a lot of performers that make people laugh, and there are a lot of speakers who give solid principles for living. I want to do both,” Mark says. His take on marriage issues is refreshingly free of both churchy and psychological lingo. “Our secular culture over-romanticizes marriage and our Christian culture over-spiritualizes it. The reality is that relationships between men and women are very down to earth,” Mark comments. “Laugh Your Way to a Better Marriage® is about helping couples get it right, get along, have fun, and achieve a successful marriage. the Laugh Your Way seminars and materials to the Latino population, a gesture that has drawn overwhelmingly positive response. Mark is Sr. Pastor of Celebration Church, a multi-site church with five campuses across Wisconsin, and the CEO of Laugh Your Way America. Mark balances his pastoral duties with a rigorous travel schedule. He speaks for churches, civic events, and business meetings and is a much requested speaker for the US Army. Mark has also been featured on national broadcasts such as Focus on the Family, Life Today and ABC News. His Better Marriage Minute radio program is heard on 250 radio stations nationwide and his daily internet radio talk show, The Mark Gungor Radio Show, debuted in the fall of 2008. He is also the creator of the television series, Love, Marriage, and Stinking Thinking broadcast around the world on various networks including TBN. Mark is the author of Laugh Your Way to a Better Marriage® (Simon & Schuster, 2008), the book based on his phenomenally successful seminar and years of working with thousands of couples. He is married to Debbie, his high school sweetheart and constant travel companion. The Gungors have been married for over 36 years and have two married children and four grandsons.